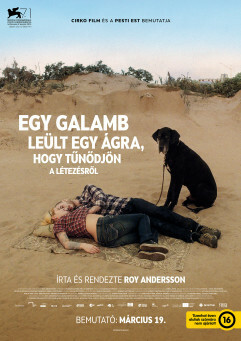 The movie created by well-known Swedish film director Roy Andersson consists of 39 tragicomic sketches that take place in an unspecified Western European country. The two main characters are a utensils trader and his mentally disabled friend who somewhat resemble Don Quixote and Sancho Panza. The title is a reference to the painting “The Hunters in the Snow” by Pieter Bruegel the Elder (1565). It depicts a rural wintertime scene, with some birds perched on tree branches. Roy Andersson says he imagined the birds in the scene watching the people below and wondering what they are doing.